The genre of small, fast-paced shooter games inspired by Call of Duty’s success have started to get quite stale in recent years, due to most of them being essentially the same. CoD itself is a prime example – Activision barely changes the well-oiled formula, they only do minor alterations on it. Everything is mostly the same, only the maps and weapon names are different. Then in 2014, a new studio called Respawn Entertainment – which includes several veteran Call of Duty developers, like Vince Zampella – came out with a game providing a huge twist on this well-known formula. This game was Titanfall, released on PC and Xbox, featuring 6 vs 6 battles with soldiers bearing jetpacks, and the ability to call in huge robots – called Titans – which either fight on their own, or can be embarked and taken over by their owners. Additionally, every game mode included AI-controlled lesser enemies, whose role was similar to minions in MOBAs – killing them granted extra points towards the player’s next Titan or if they already had it called, the current one’s special ability. The addition of these robots and the free-form movement granted by the jetpack was received overwhelmingly positively – yet the game lost players quickly. The main issues were too few weapons and unlocks, and too many game modes plus three map packs segregating the already small community. A year after the original release, Respawn made the three map packs free for everyone, but it wasn’t enough to keep player numbers up, and support for the game slowly came to a halt. 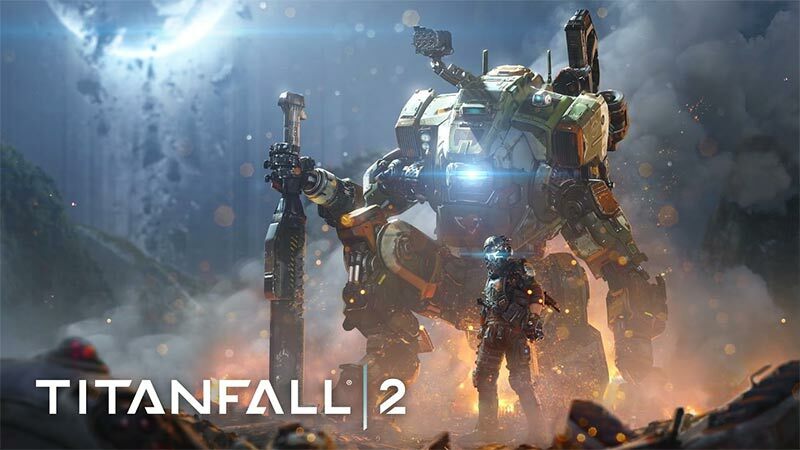 Titanfall 2 was released in October of 2016, and at the worst possible time – sandwiched between Battlefield 1 and Call of Duty: Infinite Warfare. The game’s formula stayed similar to the first one, but there were some alterations – for example, Titans no longer have regenerating shields; instead, batteries have to be ripped from enemy Titans and inserted into allied ones to give them shields. Also gone were the interchangeable Titan bodies and weapons – there were now 6 distinct Titans, each with a set of pre-defined loadouts with some minor customizations. Due to these changes, selecting specific Titans is now a bit situational, similarly to how Overwatch’s heroes are chosen by the players. The sequel also had less content in the multiplayer aspect – 9 maps, mostly with 3-lane design, which players didn’t like. By the end of support, Titanfall 1 had 22 multiplayer maps, of which 9 were added in the three paid DLC packs, meaning the game launched with 13. By the end of the sixth month after the original’s release in 2014, all three packs were available. We are now at about the same time in the lifespan of Titanfall 2 – so, how does it hold up? Well, for starters, there is less multiplayer content added during this same time-frame. So far, the game received 4 new maps and reworked one original. And three of the 4 are remasters from the first one – Angel City, Colony and Relic are the returners. There is a new small-scale game mode with its four accompanying maps, called Live Fire. This is a round-based elimination game mode without Titans, and is not too popular among the community. These mini maps are often used for Nitro CTF, a blazing-fast version of Capture the Flag, which had better reception. We also had two new weapons – Wingman Elite, a pistol, and the R201, which is essentially the exact same as the R101 assault rifle- so barely anyone thinks of it as an actual new weapon. There is also a new Titan called Monarch, bringing the available Titans to 7. Monarch is a supportive Titan with the ability to give shields to other friendly Titans and to melt enemies, offering a new and interesting playstyle. All of the aforementioned content is free, and there are some minor cosmetic additions, like Prime Titans and new weapon and Pilot camos, which are only cosmetics and don’t change the gameplay in any way. Support of the game is currently ongoing, with one DLC Drop near the end of each month, usually containing a new “main” map, some addition like a new weapon or Titan, maybe some new Live Fire maps, and additional Prime Titan skins or camo packs. The next DLC drop, slated to be released at the end of June, will most likely contain another fan favorite map from the first game, War Games. Overall, Titanfall 2 seems to be doing a bit better in terms of overall content and player numbers than the first game, but in terms of map amount and quality, some players are a bit dissatisfied – and with good reason. One map per month is not enough for most of us to enjoy the game fully, especially when we compare it to games with paid DLC packs offering more maps. At least Titanfall 2 does not have the issue of segregating its players based on content, as Battlefield does. Player numbers may be lower, but it is still easy to find games thanks to not breaking up the community.